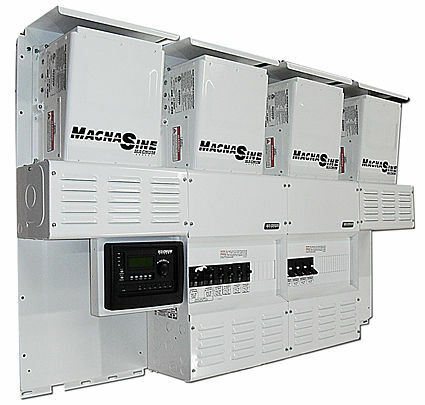 17,600 watts of pure sinewave power Four Star Solar's pre-wired and pre-tested Magnum MS4448PAE Quad Inverter Power Center is constructed with four Magnum Energy MS4448PAE 120/240 sinewave Inverters to give you 17,600 watts of power. Mounted on three Magnum back plates, it has a sophisticated ME-RTR router that organizes your connections and allows you to access information on each inverter individually. A Magnum Energy BMK battery monitor is included in this package, so you can keep an eye on your batteries' performance.